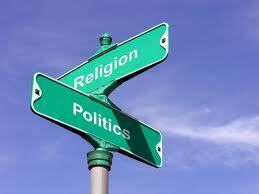 The Use and Misuse of Faith in Politics | When I Survey . . . This entry was posted in Church and politics, civility, Politics, Religious tolerance, Uncategorized. Bookmark the permalink. ← Happy St. David’s Day: Cymru am byth! Despite identifying myself as a believer, I have so many problems with religion and churches, as opposed to the direct practice of compassion in daily life and work. And the last thing I want in government is any step toward theocracy. The very need to put faith out front and center as a selling point for votes automatically disqualifies any candidate from my support. If Jesus had any confidence in political solutions, he would have talked about taking power from the Romans. Good thoughts Mikey. Most of us, even those who work in the church, have problems with religion and the churches, but on balance I think they do a great good for society. But I totally agree about the dangers of theocracy. The folks who want a Christian nation mis-read history and the intentions of the Founders. And who gets to decide who is a Christian? I’m not sure I would make the cut. Our faith should surely inform our politics, but the separation of church and state is an important principle. It protects the state from the church (and this is often overlooked) the church from the state. Here is where Niebuhr becomes helpful for me – making the clear distinction between “moral” (or as he later chided, less-immoral) man and immoral society – wherein he suggests that individuals can by grace and commitment follow the love ethic of Jesus. There is both justification by faith and sanctification, yes? Not so with groups – for a host of reason – because groups need outward direction and even force to help them follow the rules of society. Hence his insight about personal grace becoming social justice – always imperfect – but essential: it is a lower form of grace but important for creating safety in the public realm. When public religion gets reduced to so-called personal salvation alone – as it has been redefined by the Right over the past 30 years – our call to social justice not only falls on deaf ears, but can appear self-righteous. But, in fact, Richard, you were appealing to the standards of integrity and kindness as “declared through the prophets and apostles.” And I am grateful. I’m feeling a little guilty because I read you blog faithfully but never comment. So, here’s my response: I think it would be better if we would call ourselves “Christian liberals” or “Christian conservatives”, or “Christian Progressives” rather than liberal Christians, or conservative Christians, or progressive Christians. It would be less of a temptation for us or others to define our faith by our politics rather than the other way around. Hi Mick, thanks for the good comment and for being a faithful reader. As for “feeling a little guilty” go in peace and sin no more 🙂 And I guess if I have a faithful reader I ought to get back to blogging more regularly!